n 2012 Efficiency Vermont and the Vermont Housing & Conservation Board launched the Modular Housing Innovation Project. The project was a largely a response to the devastation from Tropical Storm Irene in 2011. In addition to leaving severe infrastructure damage in its wake, the storm fueled ongoing concerns about Vermont’s housing stock. Mobile home residents were disproportionately impacted by the storm and subsequent flooding, and this catalyzed interest in the major problems with this type of housing: high energy costs, poor indoor air quality, low levels of durability, depreciation of homes, and vulnerability to severe weather events. The initial project brought together a diverse group of stakeholders. 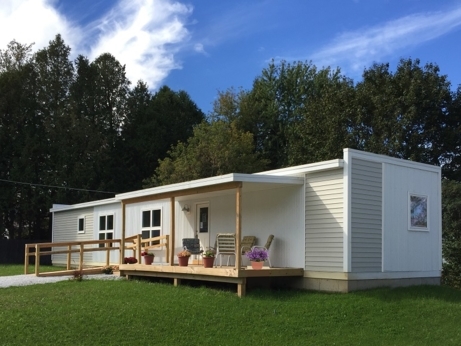 The effort resulted in the creation of a pilot program to deliver 10 Zero Energy Modular (ZEM) homes to low-income homebuyers in mobile home parks, statewide. In 2013, Vermod Homes, Vermont’s first ZEM builder, entered the construction market and now accounts for 20+ full-time jobs. Vermod employs a direct sales model and is constantly evolving using lean manufacturing principles. ZEM homes meet Efficiency Vermont’s High Performance Homes standard, which specifies insulation and air tightness levels, and guides appliance, lighting, and HVAC choices. Together, these factors can make a significant difference in a new home’s long-term durability, healthfulness, comfort, indoor air quality, energy use, and resale value. All ZEM homes are all-electric, and include solar PV that is designed to offset all energy usage in the home. As of December 2018, the ZEM initiative has delivered about 90 homes across Vermont since its 2013 launch. Homes are built in all shapes, sizes, and aesthetics, and are located on private land, in affordable rental developments, and in mobile home parks. Collectively, ZEM owners and renters have avoided $800,000 in energy costs. Finally, living in ZEM homes has empowered many residents, previously unable to access cutting-edge programs and technology, to be active participants in the clean energy revolution. Many ZEM owners and renters are viewed as early adopters within their communities, with pride evident as they show off heat pumps, solar panels, and battery storage systems to visitors. The benefits of a more inclusive clean energy movement are hard to quantify, but imperative to promote.